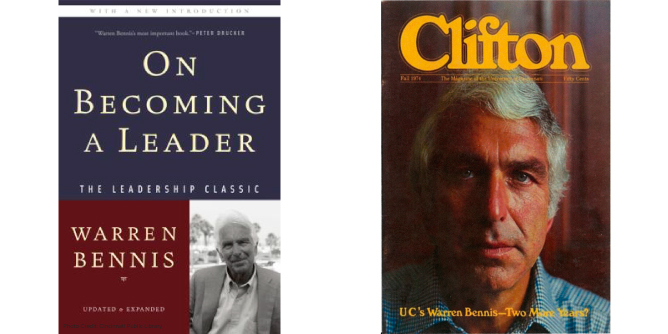 When I met Warren Bennis, now widely regarded as the father of leadership, he was not yet world renowned. He was young, tan and the President of the University of Cincinnati. He was hip, and I was an aspiring 20-year-old hippie art director for the college’s edgy Clifton magazine. We shared a glass of wine at his home one fall evening while we did a photoshoot and interview for a magazine article starring Bennis. We had a great conversation that night, which I only later realized focused on dimensions of leadership. Bennis’ time at the university was coming to an end, and he was clearly forming the ideas behind what would become his best-selling book, On Becoming a Leader. Bennis would go on to become world famous after his days at the University of Cincinnati. He is credited with developing the modern field of leadership studies. He advised US Presidents Kennedy, Johnson, Ford and Reagan. He founded and ran The Leadership Institute at the University of Southern California and wrote more than 30 books on leadership. Bennis is often compared to Peter Drucker, known as the father of management. However, Bennis believed that leadership was distinctly different from management, and that both were needed at top levels within a company to be successful. Bennis eschewed strict top-down leadership and believed that a leader should be a mentor rather than a dictator. He believed that leaders should have a guiding vision for themselves and for their company, but that they should also trust and encourage employees to use their knowledge creatively. Many of Bennis’ ideas have fully permeated business culture today. At LPK, where I am CEO, we certainly have taken to heart many of Bennis’ theories and practices when developing our company culture and our vision, mission and values. I was lucky to meet Bennis so early in his illustrious career. Even though he left Cincinnati in the ’70s, he maintained connections with the university. In fact, I spoke with him just a few years ago at the annual DAAP Fashion Show. Warren Bennis was a great man. I was saddened to hear of his passing, but I feel privileged to have known a man whose ideas continue to influence the world of business today.